Tanvi Vattikuti Abbhi is the Co-Founder of Veta Health. Veta Health offers technology solutions to engender trust, loyalty, and community in healthcare delivery. Veta Health’s solutions deliver greater transparency and patient empowerment beyond the four walls of traditional care settings. 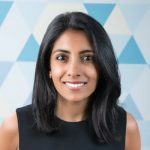 Prior to co-founding Veta Health, Tanvi worked across the Middle East, Latin America, and Asia supporting and consulting for entrepreneurs running high-growth businesses. Her passion and background lies in reducing imbalance and disparity. She holds a Bachelor’s degree from New York University.